eEnglish | Online English for the Global Workplace is structured as a communication course for office staff to enhance their communication skill in the workplace. In this course, we will focus on your pronunciation, speaking, listening, writing and reading. Speaking skill will be used in various course activities and assignments that allow you to learn about improving your communication skills in a safe, interactive environment. We will focus in this course on Public Speaking and Interpersonal Communication. The information you gain in this course will help you to succeed in multi-cultural environment, on the job and in your personal relationships. 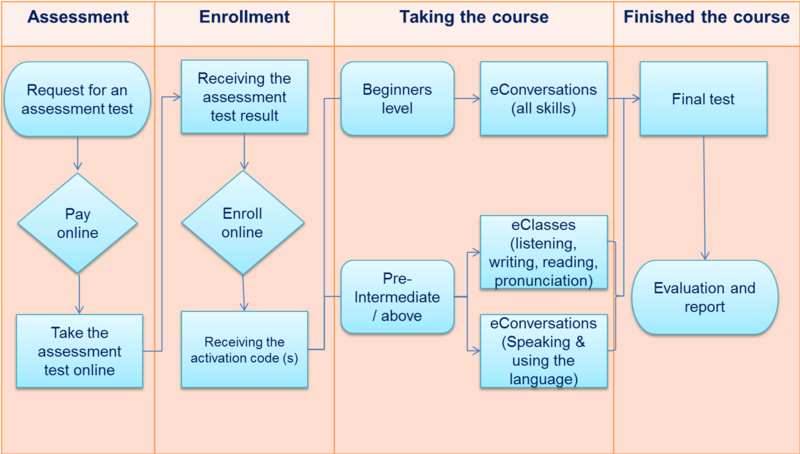 The harmonious combination between eClasses (self-pace learning) and eConversations (live instructor training) effectively helps students improve their English skills and perfectly replaces classroom training. eClasses gives students a comprehensive knowledge of English vocabulary, grammar, listening and reading while eConversations creates an interactive environment for students to work with dedicated teachers and peers in small learning groups of up to 6 students to PRACTICE and USE what they learnt from eClasses confidently. As studied, it is ineffective and inefficient for students to learn English independently at beginning levels which is considered as the foundational stage. You usually gain firm knowledge in all English skills with direct instruction from teachers. Therefore, eConversations is the best approach for those students while the combination of eClasses and eConversations are best applied for students from pre-intermediate level or above. Especially, eConnect gives learners a chance for great small group discussions. This also gives the quiet ones a chance to express ideas and knowledge when the teacher has structured the collaboration groups appropriately. We believe the students retain the skills and topical information better for assessments, also. Throw in some creative projects-how much fun it is! Moreover, eReport provides a management system for teachers to handle course registrations, administration, tracking and reporting. eReport allows businesses to quickly and easily monitor and maximize their progress. Every teacher are authorized to log in the management system to see your talent's progress, scores and skill development of your students.